Cystic fibrosis, abbreviated as CF, is a common genetic condition, wherein the lungs and the digestive system are severely affected. Affected individuals suffer from persistent lung infections, which gradually diminishes the ability of the lungs to perform its normal functions. Genetic mutation is the major cause of cystic fibrosis. Genetic mutation changes the way the protein controls the movement of salt inside and outside the cells. Due to such changes, the mucus that is produced by the secretory glands is thick and sticky in nature, as against its thin and slippery nature in normal circumstances. Two faulty genes inherited from each parent can make the child susceptible to develop this condition. In conditions when only one faulty gene is passed on, the child would not develop cystic fibrosis. How does cystic fibrosis spread? Cystic fibrosis is a genetic disorder and is passed on from parents to their offspring. What is the treatment of cystic fibrosis? There is no standard treatment plan for CF. Depending on the severity and nature of symptoms, the treatment plan is tailor made for each individual. The following are the various methods considered for treatment of CF. Medications: Antibiotics forms the preliminary line of treatment regime. Other medications are also given for thinning the mucus for improvement of lung function. In addition, bronchodilators and oral pancreatic enzymes are also given. Chest physical therapy is generally done 3 – 4 times a day to loosen the mucus. Pulmonary rehabilitation for dietary counseling, exercise training and breathing techniques. Genetic testing is one of the best ways to keep you forewarned on whether or not your child would develop cystic fibrosis. If either of the parents is suffering from the condition then genetic counseling prior to having babies can help determine the risk of development of CF. Diet and lifestyle changes in cystic fibrosis? For individuals diagnosed with cystic fibrosis, it is necessary that they pay special attention to their dietary habits. Fluid intake should be increased to thin down the mucus accumulated in the lungs. As absorption of nutrients is very low in such conditions, it is better to increase the calorie intake of the affected individual by at least 50%. In addition to these dietary changes, it also becomes extremely important to increase the fiber intake in order to prevent constipation and intestinal blockage from developing. Keeping immunization schedule regular is also necessary. Regular exercising to improve lung capacity would also go a long way in better management of the condition. Hand washing should be encouraged after each activity in order to keep the germs at bay and prevent frequent infections from setting in. 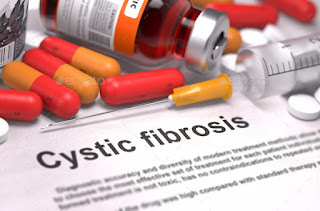 What is Ayurvedic treatment of cystic fibrosis? Ayurvedic treatment helps in liquefying the mucus and also prevents intestinal blockage from setting in. The various herbs that have proven to be helpful in cystic fibrosis include patol, saariva, kutki, indrayav, musta and patha.